Coat the spline of the inboard joint shaft with gear oil. Align the shaft splines and tap in the drive shaft with a brass bar and hammer. Set the snap ring with the opening side facing downwards. Be careful not to damage the oil seal, boot and dust cover. Squeeze the ends of the bracket hole snap ring and install it to the bearing bracket. Install the bearing bracket bolt. 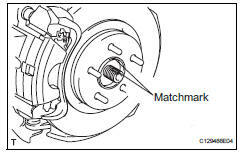 Align the shaft splines in the drive shaft to the steering knuckle with axle hub, and connect the steering knuckle with axle hub. Connect the speed sensor (see page bc-193). 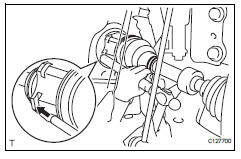 Add automatic transaxle fluid for u140f (see page ax-152). Add automatic transaxle fluid for u241e (see page ax-151). Add automatic transaxle fluid for u151f (see page ax-178). 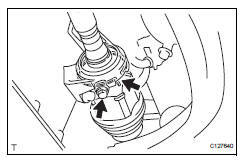 Inspect and adjust the front wheel alignment (see page sp-3).